This is where I will put my Reviews and your Reviews and cool software you can download. 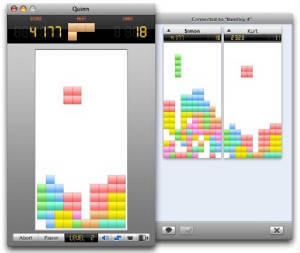 An implementation of the popular arcade game, Tetris, written specifically for Mac OS X. It features a neat user interface, perfectly integrated with Aqua, and a smooth look and feel for optimum user enjoyment. The goal was not to reinvent Tetris with yet another modification of the rules, but to stick close to the original implementation. Still theres everything you might expect including a two-player mode, network play with Bonjour support, an online server list, and five different multiplayer rule modes. Any user may create his/her own custom background and piece styles or choose from those created by other Quinn enthusiasts. This game is a Freeware. Email me a review of one of these App's and I mite post it!!! Lime Wire is the best file sharing App in the World.